The Scarpantoni family originates from Italy and arrived in Australia in 1952. In 1958 Dom bought his first property of just 5.6 hectares. 10 years later the original school property of 20 hectares was purchased in the adjacent town of McLaren Flat region of McLaren Vale. A further 12 hectares of adjoining land was purchased, making him one of the largest growers in the region at that time. In 1979, the winery was built with only a percentage of the tonnage harvest released onto the market under the Scarpantoni label. I have tried the Scarpantoni wines for a number of years and I have particularly enjoyed previous bottlings of their Sparkling Red. The Pedler Creek Wines are targeted as easy drinking styles, ready immediate consumption at Cafe’s. 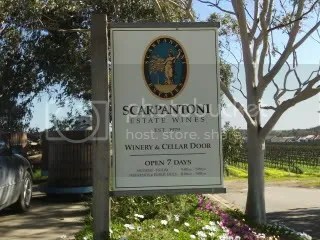 Check out the Scarpantoni Estate Wines Web Site and my video tasting of their 2 fortified wines at the cellar door. This slightly sweet sparkling Chardonnay is all about melons. It is a clean fruity style that I can see the girls drinking when they get together on Saturday night. This is a sparkling Sauvignon Blanc and you can tell even before the glass gets to your mouth. The tropical fruits and grassyness hits you quickly with the follow up of passionfruit (typical for warmer climate Sauvignon Blanc), lemons and lime flavors culminating in a good acid finish. This is a play on the fad that is Sauvignon Blanc drinkers and they will really like this wine. This is a friend friendly wine more that a food style. This wine has historically been Shiraz based, however this bottling has had some Cabernet Sauvignon, Merlot and Cabernet Franc added in an attempt to increase complexity. The aromas are dominated by the plum of Shiraz and spices (cinnamon) which flows through to the palate where one is engulfed by fruit cake flavors with a god tannin structure and a velvety mouthfeel. It is also good to get a well structured sparking red that is not too sweet. I cannot go past recommending roast turkey combined with cranberry sauce and lovely roast root vegetables. This chardonnay based wine has a somewhat closed nose with a slight hint of toasty bottle age. This toastiness continues with the flavors. The usual melon also comes through and there is also a hint of obvious sweetness. I found this wine surprisingly clean and fresh for a 2006 white wine. This wine is like smelling and tasting a bowl of strawberries and cream that has been dusted with lots of icing sugar. This is not a complex wine, however for people that like a sweeter wine will probably love this wine. There is toasty oak prevalent on the nose with some fruit character. The flavors are a mix of red and black fruits with some well integrated (and soft) oak here. This is a well developed and easy drinking wine that would grace many mid week tables with a large bowl of pasta with tomato based sauces. I found the aromas very closed. There was nice fruit with some spice here. This is a easy drinking light bodied style that would be good to drink when watching the football and you want a wine that is not too heavy – and at this price why not! This was a surprising wine. A conscience effort has been made to move away from the grassy / “cat’s pee” that wine drinkers either love or hate. Here there is aromas of green apple with a slight lime finish. The flavors though soft have a zing apple and lime (acid) finish. Certainly not what I was expecting and I would drink this with a big plate of whole freshly cooked but cold platter of seafood (no crumbing). You know the kind of platter with whole prawns, bugs, oysters, mussels, crayfish with 3 bowls sitting next to it. One bowl full of seafood sauce (or Thousand Island dressing), one bowl for the shells etc and one bowl with water and lemon to clean your hands – bring it on! Unfortunately this wine is past it’s best and the 2008 is about to be released. This wine is dominated by developed citrus peel aromas and flavors – just another example that Sauvignon Blanc should be drunk young. The aromas were dominated by peach, however the flavors were rock melon and stone fruit based. There is a long acid finish that provided a lemon flavor that I found appealing. The acid leads to this wine being able to match with food, but I believe chardonnay needs a hint of oak treatment to bring the best out of the wine and to match with food. Please check out Part 2 of this review for the remainder of the red wines and fortifides. 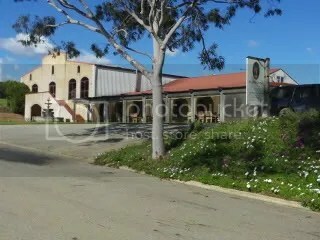 This entry was posted in Mclaren Vale, wine and tagged cellar door, Chardonnay, Mclaren Vale, McLaren Vale Wine, wine, wine McLaren Vale. Bookmark the permalink. I would like to run a fund raiser for the Royal Flying Doctor Service either at Goolwa using only “cleanskins”, as the majority of our population are retired people and though still enjoying good wine have not got a good “disposable” income….Can you through your site establish a network of interested wineries.